Have you ever wondered how far ahead you should plan your content schedule and how you should manage your workflow? What do you do to keep everything running smoothly when unexpected projects pop up? It’s a common challenge and one that many business-owners have struggled with. Today we’re going to be talking to our in-house expert, CoSchedule’s own Ben Sailer. He’s our blog manager and the one who sends out the emails that you probably receive. We’re going to talk to Ben about planning ahead, keeping on top of your workflow, and honing your publishing process. What Ben’s position as the blog manager of CoSchedule entails. How far ahead Ben plans and how much content he has ready to go at any given time, as well as his thoughts on why planning ahead is important. How CoSchedule communicates with the marketing team so everyone is in the loop at all times. How often the marketing team is publishing content and how they correlate what they’re posting to the day of the week. How Ben gets guest authors and why they are an important addition to the in-house team when it comes to producing content. How the team stays organized with so much going on and what a typical workflow looks like. 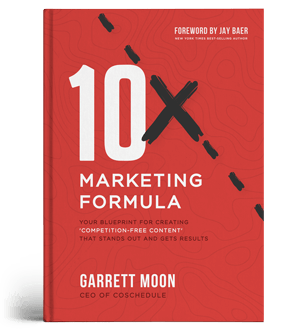 Ben’s best advice for getting more organized and establishing a marketing calendar. Nathan: How far ahead of schedule should you plan your content? How can you factor your workflow into that plan? What should you do when those quick turnaround projects inevitably pop up? I know the guy who has the answers to those questions and his name is Ben Sailer. He’s CoSchedule’s very own blog manager. You probably know Ben because he emails you throughout the week and he writes tons of great content for the CoSchedule blog. He is also the mastermind who helps us stay organized and ahead of schedule. He makes sure that we consistently have two weeks of content complete at any given time and that we’re working ahead of our publishing schedule so we never fall behind. Today on the Actionable Marketing Podcast, you are going to learn how to plan ahead, hone your publishing cadence, and crush your workflows. I’m Nathan from CoSchedule and I’m excited for you to learn how we stay organized behind the scenes here at CoSchedule. Let’s listen in. Hey Ben, thanks a lot for being on the podcast. Ben: Yeah, yeah. Thanks for having me. Nathan: It’s fun to feature CoSchedule’s blog manager. I think that a lot of people are going to really like what you have to say. I guess with that Ben, just fill me in on CoSchedule and what it is that you do here. Ben: Sure. CoSchedule, for any of the listeners who might not be aware, is an all in one marketing calendar. What that means is we are a software as a service company that provides an online editorial calendar that allows marketing teams to plan all their content, all their projects, all in one place. At CoSchedule as you said, I am the blog manager. I set the editorial direction for our blog, manage all the content that we publish, and manage our relationships with guest writers who work with us. Generally, just ensure that we’re maintaining a high editorial standard and that we are maintaining a consistent flow of quality content. Nathan: Yeah. Obviously, I think that’s really important for us. I’m wondering Ben, with your role, how far ahead do you plan content on the marketing calendar? Ben: Sure. Ideally, we try to maintain a consistent two weeks’ worth of content that’s completed ahead of time. In terms of just planning ahead, what we intend to create though, it really depends on how many ideas we have at a given time but we’re typically about two to three months out in terms of things that we have planned on the calendar that we know we’re going to create eventually. Obviously, when you’re working that far ahead, things change and different priorities come up, especially when you move as quickly as we do. We like to say that we do in three months what some companies do in a year. When we look at our calendar, the content that we have planned out, three months from now could change once the time actually comes. We know that we will never have a shortage of things to talk about and that never needs to be a discussion where it’s like, “Oh, calendar is looking pretty blank for next week. What should we do about that?” We really do make a lot of effort to ensure that we don’t ever encounter the fire drill situation where we don’t have content clearly laid out. We set at a minimum two weeks in advance but depending on the time or the occasion you’re asking that question, we could be planned all the way out to about three months. Nathan: I just want to hear your perspective on this. Why is planning that far ahead, that far in advance, why is that important? Ben: It’s important just for creating content strategically. If you’re a SaaS company like us, odds are your company has a product road map with features and things that you want to build and other things are going on with your company that are planned probably even farther out than that. It’s really important that our content be aligned with the greater business objectives that we have, that we want to achieve. Having content planned that far advance makes it a lot easier for us to make sure that we have content that’s relevant, like different features that we want or different things that we have going on ahead of time. We won’t run into a situation where we have a new feature coming out or a new update coming out and we don’t have any content pertaining to that feature or pertaining to showing people how to perform the task or the work that those features are intended to support. For example, it just really gets back to getting ourselves, I think for one, enough breathing room so to speak to just focus on doing a good job at creating the content rather than worrying about what content we’re going to create in the moment. It also just helps us make sure that everything that we’re publishing, it’s clearly tied to a greater objective or goal so that our product teams and our developers aren’t off doing one thing and then content is off in some other island doing its own thing just connected from the bigger picture. To summarize, it’s just really important just for planning content intentionally and being strategic about what we publish. I think that we get a lot of better results working that way than we would if we were just winging it. Nathan: Yeah, makes a lot of sense, Ben. Something that you mentioned was that we like to know when features are being released or when a product is being released. To keep up with that, how does CoSchedule communicate that to the marketing team so that you guys are always in the loop? Ben: Sure. Everybody in our department knows what’s going on. We have our daily scrum meetings. If anybody listening is familiar with agile methodology, or know what scrum is, or if you happen to watch the HBO series Silicon Valley, you may have heard about it. Basically, we have a team meeting every morning. One of those meetings each week, our product marketing lead will walk us through a road map, all the projects, issues we got going on. As part of that, what she’s doing is very closely tied to feature launches and things like that. We’ll get the lowdown on when those are going to be coming up and how we should be talking about those things. That is really extensive, my knowledge behind that process. We do a good job to make sure that everybody knows what’s coming up. Nothing should ever be a surprise to anyone. Nathan: We know what the plan is moving forward, we’re in the loop. Looking at a given week, how often are you publishing content? Ben: Sure. We’re publishing content, at this point, every day. We have something going live. We have what we call content or social media category, blog post, and those are educational how to posts for our audience that go out every Monday, Wednesday, and Friday. Every Tuesday, we have a new podcast episode. There’s blog post that complements each new podcast episode that comes out. We also have blog post pertaining to product updates, typically published on Tuesdays and Thursdays. When we have our overhead of CoSchedule videos which is our video series that we launched I think two or three months ago. We do those by weekly. We’ll have one that’s going out every other Monday or as they’re getting shot. We have a clear schedule that we stick to week to week with content going out every single day. Nathan: Why is it important for you to have that clear schedule of just knowing when certain pieces are going out? What’s the benefit behind that? Ben: We see benefits to that. For our own team, it just removes any ambiguity over what should be published when. We’ve got multiple people writing the content and scheduling content and so it just removes any possibility that someone’s not going to know what to put on what day. It also ensures that we don’t have a week where we publish a ton of content and a week where we don’t publish anything. Which ties into my second point which is that it creates consistent expectations for our audience. If they follow our blog, they’ll know what kind of content we’re going to be publishing when and they’ll know to keep coming back to find that content. We also make sure that those posts go live about the same time of the day, in the mornings so that say if somebody was looking for our latest blog post, you don’t have to check back in the morning and then in the afternoon to see if we finally hit the publish button or anything like that. Something on our products, it all really helps us. We really don’t have to think too hard about what is going to get published or when. That just frees up a lot of mental energy. Getting the mechanics out of the way like that so we can actually focus on creating content, which is really what we would rather be spending our time and energy worrying about. Nathan: This sounds like a lot of stuff. This is like 8 to 10 blog posts every single week. How big is the team? What do they do? Ben: Our team comprises about eight people. 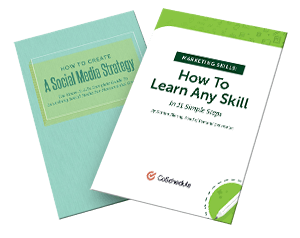 That includes a mix of people writing educational how to content about content marketing and social media. It also includes blog posts that discuss new features, new developments of our company. We also have a designer who’s responsible for maintaining a consistent visual identity for us across all those blog posts. Given the amount of content that we produce, it’s actually a relatively lean team but we’re able to make it happen. Nathan: One of the things that you do really well is getting content from guest authors. Tell me about that. Why is it important for CoSchedule to have guest author content in addition to the things that we’re creating in-house? Ben: One of the most important things that guest authors provide for us is outside perspective. Sometimes, they’ll be able to cover topics with much greater expertise and far more detailed than we would be able to do ourselves. It also helps bring the CoSchedule blog to a new audience because they’ll share it with all of their followers and that may include people who’ve never heard of us before. It also just helps us maintain just a consistent flow of quality content that our audience wants. Especially when we have a team as small as we do, it’s a big help for us when someone is willing to put in the time and the effort to share their insights with our audience for us. I’ll say those are the biggest benefits or most important aspects to running a successful guest writing program. Nathan: The reason why I wanted to ask you about that is because we had this internal stuff that you’re working in, you have guest writers to manage. How do you stay organized with so much going on? Ben: We stay organized by being very diligent about using our content calendar for everything that we publish. We will never publish anything that doesn’t go on our content calendar. From there, we make sure that all of our content is clearly color coded so I can just glance at the calendar quick and know which types of content are being scheduled on which days. Also, for all our guest writers, we have them work with us within CoSchedule and within our own products. We’re able to manage all of our workflows and all of our communication all in one place and through one channel, which really helps us build a lot of efficiencies into our workflow, just really makes it possible for us to get a surprising amount of content published a lot more easily than we would be able to if we didn’t have a tool that was purposely built for that kind of work. Nathan: Yeah. Something that I wanted to pick your brain on is that workflow you mentioned a couple times now. You have multiple different pieces of content. I’m wondering what does a typical workflow look like for you as you create content? Ben: A typical workflow for us, it can differ a little bit based on which type of content we’re creating or working on. For a typical blog post, it’ll start with ideation. We’re pretty big on brainstorming here as you know. We’ll have monthly brainstorming meetings. We all just have those meetings as needed just to produce a ton of ideas and we’ll get all of those ideas on the calendar. From there, once we actually start working on a piece of content, we have predefined checklists for every type of content that we produce. We build those using what we call task templates inside of CoSchedule. It just is essentially a reusable checklist. We’ll go through the same process with every post. Once we’ve got an idea and we’ve got a target keyword associated with that post, we’ll write about 20 to 30 headlines because that’s typically about how many headlines it takes to come up with something good if you’re doing it right. From there, we’ll sketch an outline and have another team member review that outline to make sure that we’re not missing any key information in that piece of content before we even get started writing it. And then we’ll move on to the actual writing and design phases. Once everything is ready to go, we’ll confirm the publish date and just get it all scheduled and queued up so it will publish automatically on its given due date. I think that’s probably a pretty typical workflow but for us, just a lot of the scheduling and the automation features that we have on CoSchedule really makes that a lot easier to stay on top of because I don’t have to come into work each morning and manually hit the publish button on everything. If I had to do that with as much content as we’re producing, it’d be a nightmare. Also, we have some other ways that we build consistency into that workflow. When we have guest writers write for us, we always have them work in Google Docs, just because that makes it so much easier to pass suggestions and edits back and forth. With CoSchedule too, we’re able to convert Google Docs into WordPress documents seamlessly which again helps us save a lot of time so we’re not copying and pasting things out of Google Docs to another word processor and then having to clean it up. As anybody who’s ever worked with WordPress knows, that is no fun at all. I think at a high level, that’s what a typical workflow looks like for us. Nathan: You are a person of process to make sure that nothing gets missed, the T’s are crossed, the I’s are dotted. I was wondering if I could get your opinion just on why is process important as you publish that much content? Ben: Process is extremely important because we don’t ever want to be wasting time wondering what to do when it’s time to actually get it done. By having everything laid out in checklists and predefined workflows and processes, we don’t have to think at all about what we’re going to do before we do it because we’ve already got that figured out. When you don’t have to think about what you’re going to do and you can just focus on execution, you’re able to move a lot more quickly. That’s really key for us. We wouldn’t be able to keep up with our publishing schedule if we didn’t really enforce our processes the way that we do. Nathan: Alright Ben, just to wrap this up, let’s say that I’m new to this or I haven’t started a marketing calendar or a marketing schedule, I’m looking at organizing myself just a little bit more. What’s your best advice for getting ahead or staring on this? Ben: My single best piece of advice I would have is don’t get too overwhelmed. It can seem like a lot of work upfront to spend a lot of time planning and getting organized, it might feel like you could be better using that time just working on the execution of your projects. To that, I would say the more time you can spend planning and getting organized is going to make everything else you do go so much faster. When you really know what you’re going to write, or what you’re going to shoot, or what you’re going to record, or whatever the case may be for the content you’re creating, it’s just going to go so much quicker. You’ll be happier as the end result. If you’ve actually put some thought behind what you’re creating before you actually sit down to get the work done. I think for evidence of the fact that having a very process driven approach works, you can just look at the CoSchedule blog and see how much content we’re able to produce and see the results that we’re getting. I think that shows that it works. I could see too that if you’re in a situation, or at a company, or an organization right now where you maybe have a supervisor that doesn’t see the value in using an organizational tool or building out your processes and your workflows in a way that we do or the way that we described, you can always point them to us. I think the results show on our blog every day. Nathan: Yeah. Ben, I think that’s a really good advice. Something that we talk about around the office all the time is planning your work then work your plan. Everything that you just said reiterates that. I guess with that, thanks Ben. We’ll see you back at the office. Ben: Yeah. I’ll see you in a little bit, Nathan. Nathan: We have a small marketing team here at CoSchedule that publishes tons of content. I can honestly tell you, there’s no way we’d be able to do it if we weren’t all organized and on the same page. Ben has a lot to do with that. Thanks, Ben, for sharing everything you know about publishing.